Goalkeeper, Brad Jones proved the unlikely hero as reigning league champions, Feyenoord claimed their third Johan Cruijff Schaal in the club’s trophy-laden history – the Australian saving two spot-kicks during a tense shootout to ultimately edge out cup-holders, Vitesse Arnhem in the traditional curtain-raiser to the Dutch season at De Kuip on Saturday evening. Both sides took the opportunity to field many of their summer recruits with both Ridgeciano Haps – who was snapped up from AZ Alkmaar and Fiorentina loanee, Kevin Diks named in the starting eleven for the reigning league champions alongside returnees, Steven Berghuis – who was signed on a permanent basis from Watford after spending the a successful season on loan at De Kuip last term and Jean-Paul Boetius – who returned to the club after a two-year stint with FC Basel in Switzerland. With Vitesse coach, Henk Fraser also taking the opportunity to hand starts to former PSV Eindhoven ‘keeper, Remko Pasveer, Chelsea loanee, Fankaty Dabo, ex-Ajax midfielder, Thulani Serero, former Heracles man, Thomas Bruns, Slovenian international, Tim Matavz as well as Brian Linssen – who arrived from Groningen in the summer, it was hardly surprising that the first half in particular lacked any real fluency, especially from the cup-holders who found themselves on the back foot from the opening whistle and a goal-down just seven minutes in – Tonny Vilhena showing incredible vision to set Boetius away down the left, who then cut inside Dabo and found Jens Toornstra unmarked at the edge of the area with all the time in the world to volley the ball low into the bottom right-hand corner of Pasveer’s net. 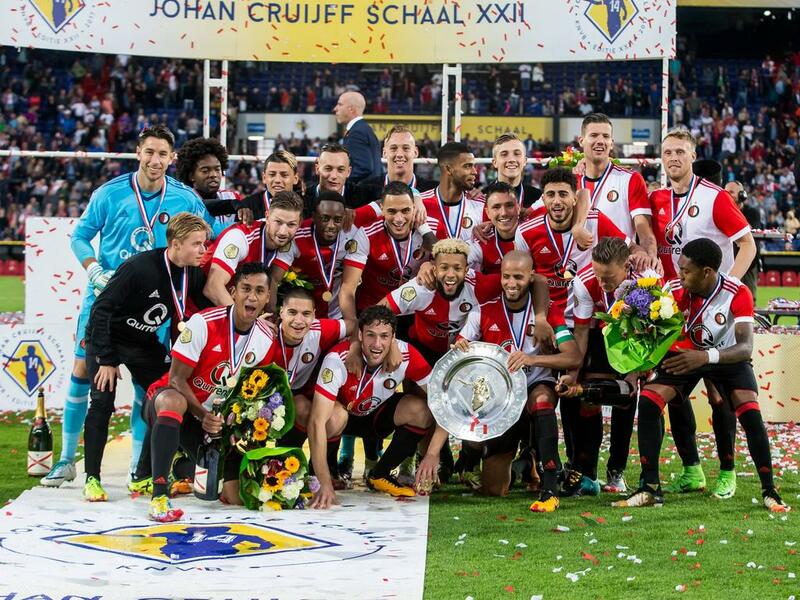 This year’s edition of the Johan Cruijff Schaal included several new features, one of which being the fact that the reigning league champions were handed home advantage, which, in the early stages at least, seemed to swing the contest in Feyenoord’s favour as, cheered on by a vociferous home backing, both Vilhena and Boetius were presented with half chances to add to the host’s lead inside the opening twenty minutes. However, Feyenoord failed to build on their early supremacy and, four minutes before the break, the cup-holders very nearly found themselves back on level terms as Linssen saw his fierce drive from the edge of the area slam against the underside of Jones’ crossbar with the Australian ‘keeper left rooted to the spot. The second half began in much the same way as the first with Matavz being denied by a last ditch challenge from Karim El Ahmadi when through on goal after which the hosts streaked the length of the field and, when Pasveer palmed a vicious Vilhena drive from just outside the area into the path of Nicolai Jorgensen, who gleefully slotted the ball into the back of the visiting ‘keeper’s net, it appeared as through the reigning league champions had doubled their advantage. However, another new feature of the traditional curtain-raiser of the Dutch season saw the introduction of the video referee and it was at that moment that official, Danny Makkelie opted to check what many believed to be the legitimacy of Jorgensen’s strike – with the Danish marksman appearing to have been ruled offside. When the whistle came however, it was to award the visitors a penalty – the official having deemed El Ahmadi’s earlier challenge on Matavz a foul, leaving Alexander Buttner to step up and send Jones the wrong way from the resultant spot-kick thirteen minutes into the second half. With both sides squandering opportunities in a largely uneventful second period – Jorgensen lashing the ball wide of Pasveer’s right hand upright when away and clear twelve minutes from time before an Eric Botteghin error let Linssen in at the opposite end two minutes later – only for the former Groningen man to hit his shot straight at Jones, the stage was set for the lottery of penalties. In the lead-up to the game there had been much debate in the media as to who Feyenoord coach, Giovanni van Bronckhorst would back as his number one for the coming campaign with both Jones and Dutch international, Kenneth Vermeer pressing their claims until the latter was struck down with a hand injury that left the former Ajax ‘keeper side-lined for two months earlier in the week. Whether his inclusion came by default or on merit, Feyenoord’s Australian stopper certainly did his chances of securing a second successive campaign as van Bronckhorst’s first choice ‘keeper no harm at all by denying both Tim Matavz and Milot Rashica from the spot as the reigning league champions quickly shot into a 2-0 lead with both Jan-Arie van der Heijden and Jean-Paul Boetius making no mistake with their respective efforts. Although both Navarone Foor and substitute, Charlie Colkett managed to beat the Australian thereafter, the damage had already been done and, with Jens Toornstra having tucked away his penalty, the stage was set for last season’s top scorer, Nicolai Jorgensen to send Pasveer the wrong way and bag just the third Johan Cruijff Schaal in Feyenoord’s trophy-laden history.